We pride ourselves on only repairing what you actually need fixed. We want your business for the rest of your vehicle-owning life! Shady business practices, or “up selling” to make a greater profit, are not the way to earn a customers trust. We are extremely pleased with our customer retention; most of our clients have been using us for years, and we’ve grown primarily through positive word of mouth and referrals. All of our work is guaranteed for at least a year on parts and labor, unless otherwise specified. We can match or beat any* full-service shop, many times at a significantly lower price. Coming home and finding a surprise birthday party waiting for you is fun; finding extra charges on your bill for car repairs…not so much. 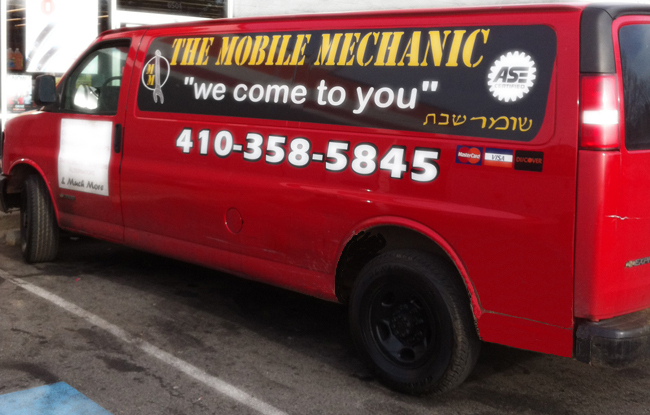 That’s why at The Mobile Mechanic in Baltimore, we always let you know upfront the repairs needed and the cost associated before we do any work on your vehicle. We love saving people money, and if it can be repaired instead of replaced, we always strive to get you up and running quickly, and as affordably as possible. Safety is huge for us. A lot of bad things can happen if you aren’t careful with who messes around under your hood. We are licensed, insured and ASE certified, and we always make certain we send a qualified tech with years of hands-on experience to your vehicle. Often we will send a second technician to verify findings if it’s a large job to assure you aren’t paying for something that won’t fix the problem. We do our very best to give accurate diagnosis and go right to the heart of the issue, using language you understand and not hiding behind a mess of technical jargon to confuse our customers. Over the years the auto industry has gotten a bad rap due to some questionable business practices, and we believe we are showing people that there are still honest folk in this field, making a living with our convenient and reasonably priced services! *When we say we can match or beat other repair quotes we mean just that. It must be a reputable full-service repair shop, not your uncle’s friend around the corner, or that guy you met at the bar who says he can fix your car for $50. We reserve the right to verify all repair quotes. Cities Served: Cockeysville, Hunt Valley, Elkridge, Ellicott City, Lutherville-Timonium, Owings Mills, Randallstown, Stevenson, White Marsh, Towson, Pikesville, Dundalk, Halethrope, Catonsville, Nottingham, and Winsdor Mill. Hours: 7:30 A.M. - 5:00 P.M.